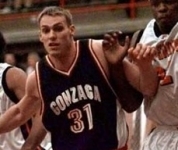 The 1998-90 Gonzaga team was a relative unknown nationally. Early-season wins over Memphis, Washington and Washington State got Dan Monson's team a little attention, but it was until the West Coast Conference Tournament that people really began to pay attention. 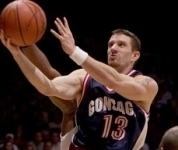 Led by Matt Santangelo, Richie Frahm, Casey Calvary and Quentin Hall Gonzaga ripped through the WCC tourney en route to its second-ever postseason appearance. The Bulldogs stunned Minnesota in the first round of the NCAA Tournament and would go on to beat Stanford and Florida before falling to Connecticut in West Regional Final. 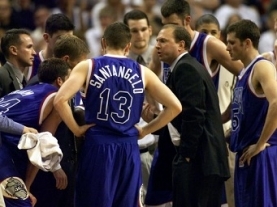 It's the only time Gonzaga has been to the Elite 8.